Brenna Two Bears ’17 was awakened to her life plan around age 10. Two Bears’ path has enabled her to travel from the West Coast to the East Coast and back again, all in pursuit of her goal. Two Bears grew up in Black River Falls, Wisconsin, and Flagstaff, Arizona. 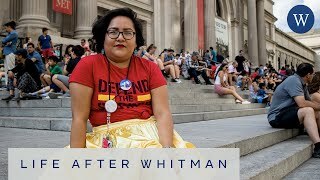 She graduated from Whitman with a bachelor’s degree in art history and visual culture studies (AHVCS) in 2017. Two Bears credits her time at Whitman for giving her a greater sense of empathy, while also stimulating her consciousness. “Though it was never easy going to college at Whitman, I know it wouldn’t have been different anywhere else. At least there I was able to come to my own conclusions about the world and its injustices in an environment going through its own process to be more inclusive,” Two Bears said. Two Bears also praised professors within the AHVCS department for assisting her to develop her viewpoint as she prepared to enter the world. With Gulbransen’s assistance, Two Bears created her independent study, which focused on the way indigenous people, culture and art are represented in museums. After graduation, Two Bears received an internship at the School for Advanced Research (SAR) in Santa Fe, New Mexico. Founded in 1907, SAR promotes indigenous creativity through artist residencies and stewards one of the world’s finest research collections of Southwest Native American art. Because of SAR’s small staff size, Two Bears was able to work in various departments. The experience provided her the opportunity to work with their collection of Navajo rugs, teach children at the Santa Fe Youth Detention Center and serve as a representative for SAR at Native art conferences. It also inspired her to apply for other internships, one of which was the Lifchez/Stronach Curatorial Internship at the Metropolitan Museum of Art in New York City, which she received in 2018. Two Bears is passionate about Native collections. Part of her internship was to support the Native American Graves Protection and Repatriation Act, which returns culturally sensitive and funerary objects back to their tribes. The first day of her internship included the opportunity to sit in on meetings that would shape the history of how the museum told the story of her people, which for Two Bears was an eye-opening experience. Brenna Two Bears ’17 spent the summer as an intern at The Metropolitan Museum of Art in New York City. “Places that originally exotified and othered my people and our art were now welcoming our input seriously, for the first time,” Two Bears said. Two Bears also conducted specialized tours for the museum. As part of the tour, Two Bears was allotted four objects that best represented her chosen theme of environment. Two Bears’ internship with the Met was scheduled to run through 2019, but she decided to end her internship early to pursue opportunities that aligned with her ultimate goals. In order to become a certified consultant, Two Bears will need to train with Dartt for one year. While she waits for her training to begin, she has returned to Arizona and is becoming certified as a substitute teacher.